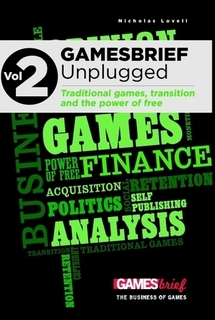 "Buy GAMESbrief Unplugged Volume 2 for 40% off"
GAMESbrief also doesn't having swearing in its name. At any rate, GAMESbrief is an industry analyst blog run by industry analyst, Nicholas Lovell. We used to work together for GameShadow, and I sometimes write stuff for his blog. Sometimes that stuff gets polished, supplemented and printed up in a lovely coffee table book called GAMESbrief Unplugged. If you want to know what really happened at Realtime Worlds, and how to avoid the same thing happening to you, you need to read this book. If you want to understand what role publishers and retailers will play in the future of the games industry, you need to read this book. If you want to be prepared for the next decade in a fast-changing games industry, you need to read this book. So, that's enough shameless plugging for one month. Go buy for anywhere from £8.97 - £60.